That’s supposed to be a rhetorical question, but Robert Jeffress doesn’t provide the expected answer. He thinks Jesus would slam the door. Call it tough love. The disagreement between Jeffress and mainstream Texas Baptists cuts to heart of what Christian faith is all about. The pastor of First Baptist Dallas grew up under the preaching of W.A. Criswell. In 1956, when Jeffress was but a babe in arms, Criswell stood before a gathering of Southern Baptist evangelists in South Carolina and issued a call to arms. Like his childhood pastor and mentor, Rev. Jeffress doubts Southern Baptist pastors can win the culture war unless they man up. Wally Amos Criswell lived to regret his defense of Jim Crow segregation. “Never have I been so blind,” he confessed a decade later. Is the current pastor of First Baptist Church, Dallas headed for a confession of similar moment? No time soon, I’m afraid. Like the pre-conversion Criswell, Jeffress wraps his capitulation to secular conservatism in heroic language, but no one is fooled. Like his mentor, Jeffress parrots the prejudices of the people in the pews. He wouldn’t survive a single hour if he didn’t. Jesus went to the cross because he refused to deny the radically inclusive ideals he preached; Jeffress maintains the fawning adoration of his constituency by denying everything his Master stood for. He inherited one of the largest churches in the nation and needs to build his membership base. Therefore, everything Jesus said about the poor, the prisoner, the oppressed or the children in our midst must be divorced from American immigration policy. Ayn Rand was offended by the very thought of closing the American border because she had stood on the hurting side of the wall. Would a trip to a detention center have the same affect on Robert Jeffress? Marla Bearden, disaster response specialist with the Baptist General Convention of Texas, has seen hearts and minds at the Mexican border. Some contend that Criswell’s about-face on segregation was motivated by his desire to serve as president of the Southern Baptist Convention. Outspoken bigotry was no longer acceptable in the SBC and the Texas preacher was forced to adapt. If that’s true, I long for the day when a sea change within First Baptist Church, Dallas forces a hard-hearted pastor into the waiting arms of Jesus. Blind Preacher leading D Blind. His followers must be stupid like him. This ‘article’ skips all over the place. I’m sorry but even if Jeffress said it you cause me to shake my head with your lack of focus. It’s tempting for Rev. 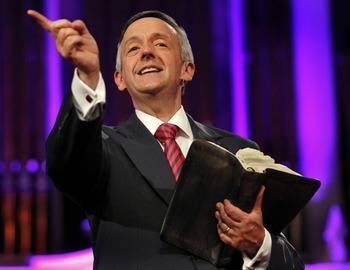 Jeffress to tell his congregation what they want to hear. Does he believe it unreservedly? Who knows? Most Christians have doubts about their doctrine, even the ones with “patented” macho-Christ spins on their preaching. He would have to close his heart and mind to what would happen to those children out in the desert, though, wouldn’t he; on the other side of that Great Wall of Texas? They wouldn’t just be walking home to Central America, not all of them, anyway. Why can Jordan offer accommodation to so many refugees from Syria, Lebanon, Palestine, etc, but the far richer USA cannot follow international law on the treatment of refugee claimants from Central America, or President Bush’s own law?